As Brad Pitt's character Bass states after hearing Solomon Northup (Chiwetel Ejiofor) recount the story of how he was wrongly kidnapped and sold into slavery, this is an amazing story, but in no good way. 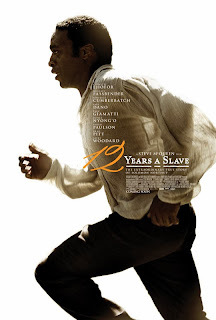 There has been much made of director Steve McQueen's third feature that adapts the autobiography of Solomon Northup and takes an unflinching look at how slavery and ownership dominated the south and was inflicted upon the unfortunate souls born into that time period. Northup's tale is one of emotional and physical devastation and the success of the film hinges on being able to convey both of those impressions with equal weight. If there is an ideal director to take on this stark subject matter it would be the fresh pair of eyes and mind that is McQueen who, after his previous two films (Hunger and Shame) has focused on the downsides of humanity enough to understand where he needed to go to reach the emotional depths that the subject of slavery needs to take on. It is a subject that deserves this unflinching look illustrating how slaves were treated, how they were perceived, and how some plantation owners saw them and treated them as employees while others saw them as little more than property they could with what they please. 12 Years A Slave doesn't dive into the politics of what started slavery, why these white owners saw these people as they did, or how our main characters might put a stop to the tragedy, but instead we are forced to accept the facts that define our history and that is the true story of Solomon. Neither Solomon nor any of the slaves he comes to meet along the way knew why there were some slavers like William Ford (Benedict Cumberbatch) and others like Edwin Epps (Michael Fassbender), why it all began or how it was going to come to an end, but they simply had to accept the idea that this was their life and that they were meant to deal with it and that harsh reality is what McQueen forces his audience to accept as well with the only glimmer of hope being implied by the title. This is a film both so involving and at the same time so draining that you feel exhausted after having experienced it. It is a damn tough film to watch, but a necessary lesson in perspective that ultimately makes you appreciate what you've seen if not for the unflinching history lesson, but for the craft in which it is conveyed. share a rare moment of peace in 12 Years A Slave. We first meet Northup as he is taught the process of cutting cane and preparing it for the planting gang. This is a far cry from his comfortable life in Saratoga, New York where he operated as a free man and a talented violinist that was rewarded nicely for his skill. While the one glaring issue with the film is not so much one at all, but instead the fact we do not get the full impact of just how much time is passing as we go on this journey. Solomon is drugged and kidnapped by men simply named Hamilton and Brown (Scoot McNairy and Taran Killam) and then transported to the south to be picked up by Freeman (Paul Giamattii literally showing up for one scene here) who purchases Solomon at auction and sets him up to be sold to plantation owners once he polishes them off. From here Solomon is sold to Master Ford along with Eliza (Adepero Oduye) whom he separates from her children and has an understandably difficult time dealing with it only to receive no empathy from Mistress Ford (Liza J. Bennett) as she dismisses her depression with a simple, "your children will be forgotten soon enough." Solomon spends a presumably fair amount of time with the Ford's but it is clear early on that an overseer by the name of Tibeats (Paul Dano) has both a lower intellect and hunger for power that will not serve him well when coming up against an educated man forced into submission as Solomon was. When tensions come to a head, Ford is forced to trade his debt on Solomon to a different slaver. This, unfortunately, happens to be Mr. Epps, a despicable human being who prides himself on breaking his slaves, forcing them to live under the worst conditions imaginable. It is on Epps' farm where we come to realize the more gritty, harsh realities of the time period both through Solomon's journey and Epps' prized possession, Patsey (a breakout performance from Lupita Nyong'o) whom he treats as his own play-thing while his Mistress (a chilling Sarah Paulson) beats her down even further with her jealousy. It is only when Solomon comes in contact with Bass, a man Epps has hired to build a gazebo on his land, that we see a light near the end of the tunnel for our protagonist. This is clearly a project not intended as a popcorn flick or as a way to escape for a few hours, but instead screenwriter John Ridley (Red Tails) and director McQueen were intent to make a powerful, artistic piece that really cut to the heart of the embarrassing scar slavery has left on the U.S. For the most part, they do this to a grand extent with lush photography, set and costume designs that truly capture the tone of the period and performances across the board that are superior even in the smallest of supporting roles than many movies might find in their lead actor. It almost goes without saying that 12 Years A Slave is a good movie, a film that will hit you deep in the gut and make you stand up and take notice and even look at the world differently than you might have prior to being confronted with the reality it presents, but in that execution it didn't grasp the level of greatness I expected from such a strongly hailed film. It should be made clear this does not come from the fact that I hold something against it because I thought it too gratuitous in its violence or gruesome in its representation, but more because it seemed disjointed in moments and never hit a stride that was consistent for the remainder of the film. In fact, the few complaints I do have concerning the film have nothing to do with its story. Instead, they recall that slight qualm with how the passing of time is conveyed with some inadequacy and that the pacing sometimes seems to have a misstep and depending on the given circumstances around the point we're at in the story may or may not pick back up quicker than you expect it to. Again, these are small issues I took with the film as a whole and are only stated here to justify my reasoning for not rewarding it a perfect score. McQueen has so much going for him in terms of craft in fact that it is easy to forget these shortcomings as it is more fulfilling to take in both the horrific and fascinating ways McQueen uses his camera; his still shots and his long takes to emphasize the pain and mindset many of our characters live with day in and day out. There are two prime examples of this technique that are more than cause for audience members to look away and close their eyes, but even then McQueen and his sound mixers make sure you feel the impact of what is happening on screen. There is nowhere to run, no way to hide from the brutality of this world and that is exactly what McQueen wants you to understand, he wants to put you in the middle of the psychology of these slaves and in that regard, he succeeds several times over. Edwin Epps (Michael Fassbender) and his Mistress (Sarah Paulson) watch on as their slaves work. Only aiding in this closely detailed and highly artistic vision of the south are the performances McQueen has elicited from his top notch cast. Much will be made of the many white male performers that come and go throughout the course of the film and Michael Fassbender's is surely one worth seeing and attempting to comprehend how he might have even become such a man, but this is Ejiofor's show and he commands it from the opening shot on. He embodies Solomon who, despite his esteemed career and status in the north, somehow has the ability to understand that odds are not in his favor and he will likely never see his family again. That he succumbs to this realization so early in the film is something of a shock to the audience I think as I expected for much of the movie to center on Solomon's countless attempts at getting out of the situation he was so unjustly placed in. Instead, we see him, just as all the other slaves around him, come to terms with the fact that their lives will be all about surviving and nothing more. It is a harsh reality, but there was no other way of life known at that time. I'm sure that many of the slaves even were surprised by what opportunities they were afforded, no matter how small, simply on the basis they were conditioned to think themselves as less than human. This especially comes to mind when taking in the full effect of Nyong'o's performance which gives us the perspective of the worst position a slave could ever hope to have. The affection of her master, the spite of her mistress and no matter how hard she works, how much better she does her job than any other slave on the farm, it is her that will face the brunt of both punishment and the disgusting desires Epps has a need to fulfill. If we didn't already feel a compassion for Solomon and his plight, the introduction of Patsey and the layers of emotion Nyong'o brings to the character will certainly have your heart truly breaking at the thought human beings could bring such hatred and pain to their fellow man. Cumberbatch offers his inherently charming self as Ford while both Paulson and Fassbender will be revered for the fact they were able to find a place within themselves that allowed them to resurrect such despicable human beings. Others in the cast, including Dano, Alfre Woodard, Quvenzhane Wallis, and Pitt bring varying degrees of effectiveness to their roles depending on the amount of influence (Wallis will only stand out if you know who she is, otherwise it could have been anyone) that their characters have, but it should be said that for such a limited amount of screen time, Dano brings an impressive duality to his role. There is so much more to be discussed concerning this film that it is hard to find a place to stop. As I watched this story unfold I couldn't help but take it in and begin to ask myself questions and wonder how those questions should be taken into account when evaluating the film, but it more than anything seems to have added to the respect I have for this movie. It is a daring film that was willing to go that extra mile and put you in the psychological state of a slave that lived under constant pressure and stress, a life that many would say is not worth living, yet our ancestors are the ones who subjected these people to that lifestyle and held their one chance to make something of this one life nothing more than an existence they would have never lived given the choice. When Fassbender's Epps uses scripture to try and justify his actions I wondered how African-Americans have not come to resent a white God that subjected them to a life of pain and suffering. That their white masters taught them their white God condoned this type of behavior and punishment makes it a wonder that any African-American today still upholds the Bible as something worth living by. From there I began to wonder what drives Fassbender to play these roles in which he portrays such dislikable people. Whether it be in Shame, X-Men: First Class, Prometheus, or even The Counselor it seems he has an appetite for those seriously flawed, but layered men that have deep-rooted vindication for their actions. From here, it went on and on from how far have we come and how much have we recessed to how does this compare to Django Unchained and did this make Django seem insensitive? I think Django was meant as a revenge fantasy so as to give the black man a surrogate to exact retribution on the white man whereas 12 Years is more a pure documentation of how it actually was and gives us that setting unfiltered. They come at the subject from two vastly different perspectives that it is impossible to compare, but what that brings to light about McQueen's work is that he wants to present us with this picture and then sit back and have us interpret it as we will without giving any indication of his own stance. It is a method of storytelling that doesn't always work, but when done with as great an understanding of the story and subject as McQueen seems to have it can be all the more fulfilling as an active audience member. And if that isn't enough (which it very well should be) the final scene is one of both joy and heartbreak in the actuality of what Solomon's life had become and what was really taken from him.